On the road again, as the summer days stay at their very longest, this month inspires adventures and holiday getaways from crowded Italian city centers. For us, this often means jumping in the car to head somewhere to breathe in Tuscany’s Renaissance roots, a region so known, yet so full of unknowns. Here you'll uncover treasure trove of fine art and deliciously simple food. The first step, is how to get there. The advantages of renting a car and getting to know this popular region on a more intimate basis is so heavily recommended, it allows you independence and a chance to go where other's don't. Where to go? Perhaps up a twisty road, high up in the mountains in Vallombrosa, finding paradise in a few-day sojourn at a quaint village, a welcome respite from July’s relentless sun down below. Skip the crowded beaches of Viareggio and Maremma this summer and head towards Lunigiana instead, a corner that still remains untouched by mass tourism. 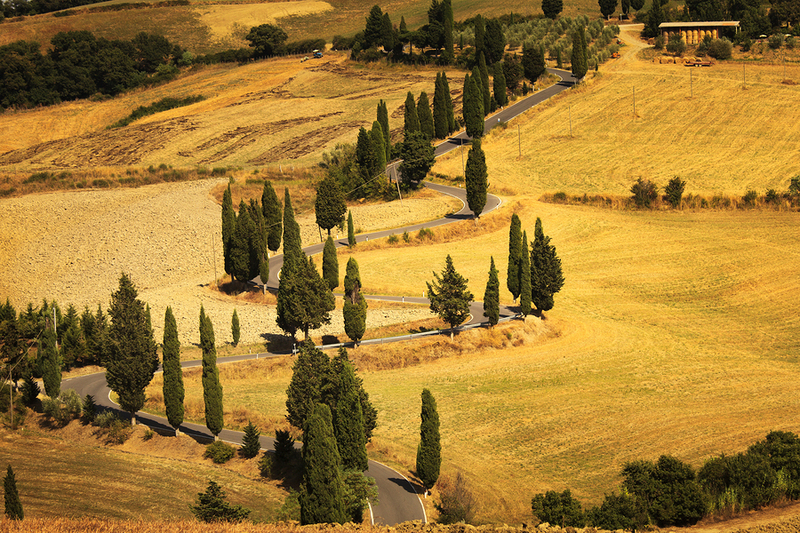 Or seek out the rolling hills and expansive vineyards of the stunning UNESCO-protected Val d’Orcia valley. Sure it's been "found" however it still remains one of my favorite places on earth. Here, on any given day, you can see landscapes so vibrant, they’ll put any online screensaver to shame. In honor of Top Tuscan road trip ideas, I’ve compiled a list of three of own personal favorite getaways by car. Words can't really do the Val d'Oricia vallery justice, this lush green part of the world dotted with cypress trees stretches south from Siena to Monte Amiata and happens to be home to some of the best wine in the country. Hence it is no coincidence that it absolutely warrants a visit, it is quite simply, the best slice of Tuscany's pie. Last time I went, we based ourselves in a pretty guesthouse just outside of the charming vtown of Monticchiello. This unspoilt hillside ancient village is as charming as they come with a history dating back to the 970's, truth be told, it's barely bigger than a breath. However when one wants to truly get lost -- this is the kind of place that anyone would be delighted to discover. Flowers adorning every doorway, every corner is prettier than the last, locals are used to visitors but yet still are ready with a smile and a laugh. The few restaurants in town all serve delicious, hearty local cuisine and during the summer months, the entire town entertains in an outdoor theater "teatro povero" running until Ferragosto, the 15th of August. It is unequivocally the perfect town to get your foot into Val d'Orcia's door. Nearby you have access to the very best of Val d'Orcia, including the must-see Renaissance hill town of Montepulciano where I had a fabulous meal (including the famous bistecca alla fiorentina, Florentine steak) at Osteria Acquacheta. 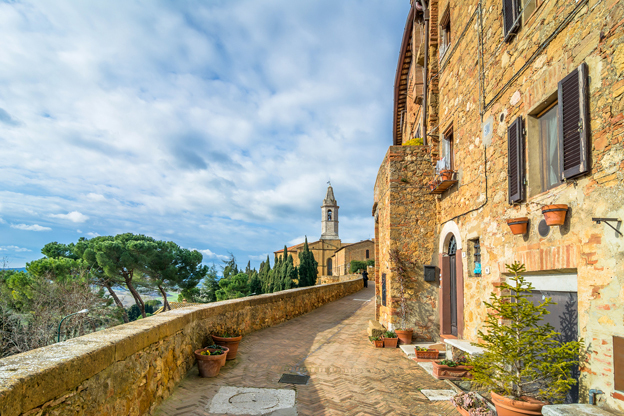 Equally as charming is the thermal town of Bagno Vignoni, the gardens of the 15th century estate of La Foce, and the UNESCO-recognized town of Pienza. You might have heard of the aged-pecorino sheep cheese that hails from here, and yes, it's really as good as it sounds, best paired with a gob of chesnut honey. This is not the time or the place to think about diets, dive into the pici, drink the wine, you'll thank me later. The cobble-stoned streets of the city make for a perfect after lunch stroll on streets, they allude to romance with names like via del amore or via del bacio. 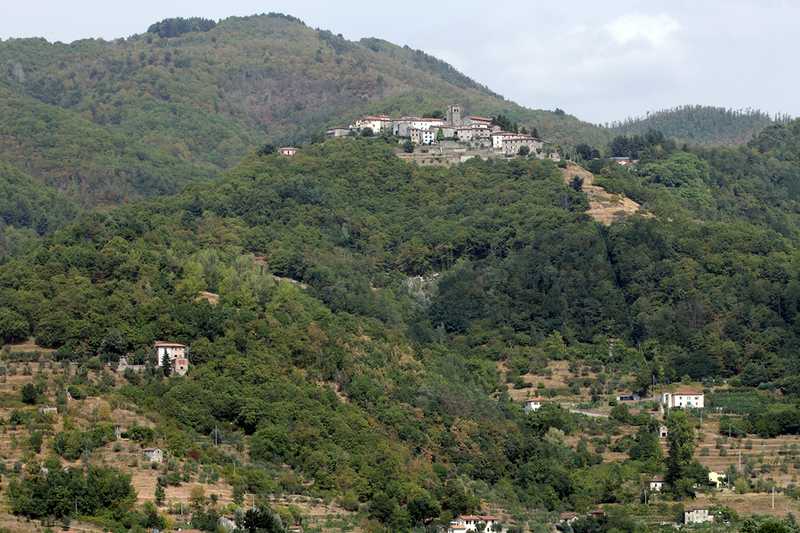 If you haven't heard of Lunigiana, you would hardly be alone, this untouched area of Tuscany never quite makes the tourist must-see locations, but that's a good thing as far as we're concerned. Up north, close to the Ligurian border and dubbed "the land of the 100 castles" with pristine medieval villages, this is a pleasant place to explore during almost any season. It's worth spending a few days of travel here, with stops including the towns of Filattiera, Bagnone, and Pontremoli, Villafranca and the 12th century Malaspina castle, and Fivizzano. When it comes to distances you can expect a 45 minute drive from Carrara to VillaFranca di Lunigiana. You can get a run down on each individual town via this great guide by InToscana. All of which would make great stops along with the underrated town of Carrara, known for the surrounding Apuan alps with their otherwordly marble caves. Our suggestion is to hire a guide to take you up to the quarries which is so much fun for any age, make sure to ask about the famous local "lardo di colonnata." This cured pig’s back fat is seasoned with rosemary and other herbs and spices in a marble basin for no less than 181 days. It carries a delicate flavor and is best sliced thin and served on warmed slices of bread as an antipasto. Don't let the word lard scare you as it isn't the same thing as what you are thinking, instead this should be considered a dish of the gods. Heading south of the Lunigiana and north of Tuscany's Pisa, Lucca is the area known as Garfagnana, a mountainous place with hearty food in between the ridges of the Apuan Alps and the Tosco-Emiliano Apennines. It's a trip that could be easily combined with the lovely town of Lucca, which also happens to be one of my favorite Tuscan towns. 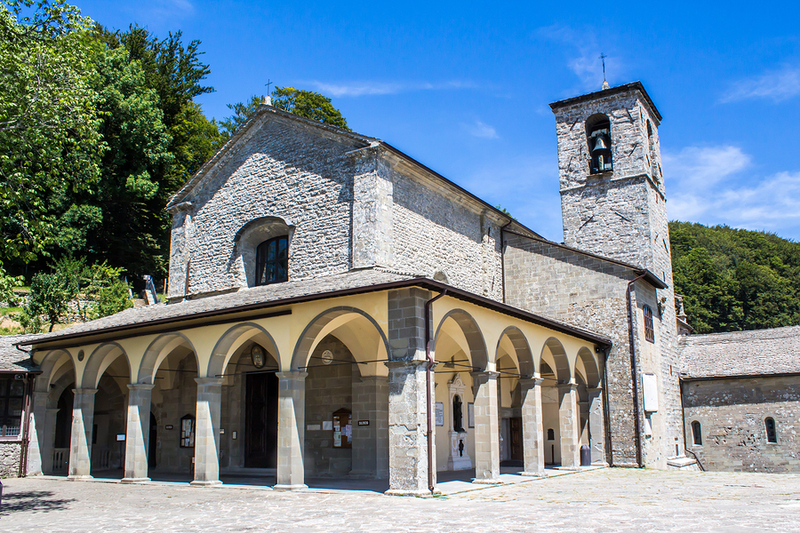 The main town here is Castelnuovo di Garfagnana but it's not our favorite, instead we suggest heading to the medieval town of Barga in the Serchio River valley. Ironically it is known as the most "Scottish" town in Italy due to a large number of residents having emigrated to Scotland in the early part of this century. The historical center is home to many worthy historical monuments as per usual in this part of the world but half the reason we visit is for the food. The local cuisine features a variety of dishes using mushrooms and chestnuts found in the surrounding mountainours area. For those visiting in July, we suggest checking out the local jazz festival which has been attracting visitors for over 30 years. You can leave your car Barga's western entrance, look for the parking lot at Porta Mancianella. Imagine a secluded valley that most have never heard of, The Casentino Valley is a lush secret in between the cities of Florence and Arezzo. On one side, you have the Appenines, on the other, the formidable Pratomagno, one of the four valleys comprising the Province of Arezzo. It is one of my favorite places to come when we need to escape the summer’s insufferable heat. Typically our first stop from Florence is the hermitage hideaway of Vallombrosa, a large abbey founded in 1038 and mentioned in John Milton’s Paradise Lost. Only an hour from Florence by car, it’s a place that still inspires the spiritual sort and remains a cool temperature no matter how boiling the center of Florence is. An extra stop on the spirituality- find yourself train, should most definitely be the Sanctuary of La Verna, where the revered Saint Francis received the stigmata. Now it is comprised of a vast monastic complex and a popular stop for pilgrims, the space includes monastery, church, museum, chapels, and the cave that was St. Francis’s cell. Verna is one of two monasteries located in the Casentino Forest National Park, one of the largest and best preserved parks in Italy with 800 kilometers of hiking paths and 368 square kilometres of forest. Another ancient medieval village worth visiting 65 kilometers from Florence past the Nippozzano vineyards is the drenched-in-history Poppi, known for the 700+ year old Castello dei Conti Guidi. A pleasant place for a sojourn and For food, our pick would be La Tana degli Orsi in the town of Pratovecchio, well-known among Tuscan foodies who don't mind trekking it out here for the local Casentino cuisine and great wine list. The article has been sponsored by AVIS but all opinions are 100% our own.